Michael Scott Kingery was born March 29, 1961, in St. James, Minnesota, to Ken and Marion Kingery. The Kingery family moved to Atwater, Minnesota, when Mike was about six months old. There Kingery’s father owned and operated the Atwater Bowling Center. Kingery attended Atwater Public School as did his four brothers, Doug, Bob, Tom and Jim. Each was a standout athlete in his own right. By accounts of many close to the Kingery family, “Doug was the best athlete in the family.” Kingery played VFW and American Legion baseball in high school. He attended St. Cloud State University, was drafted by the Royals, and spent six seasons in the minor leagues before being called up by the Royals. Kingery credits his brother Doug with being the force that found and developed the talents that led to his success in the major leagues. “Although Mike was 11 years Doug’s junior, he got to play on his older brother’s softball team.” Kingery credits Doug for the work ethic he developed. “I was 18 then and I did whatever Doug told me to do. He’d tell me to hit a ground ball to the shortstop and beat it out. So I would hit a ground ball to the shortstop and try to beat it out.” Kingery, a born-again Christian, credits Jesus Christ for giving him the innate talent to be a professional athlete as well as the temperament to survive in the major leagues and remain grounded in addition to a retirement that saw the growth of his family, the development of “Solid Foundation Baseball School, Inc.,” a baseball training school that Kingery owns and operates, and the ability to deal with the 2006 death of his brother Doug. While in high school, Kingery played with the American Legion and VFW teams in Willmar. In 1977, Kingery was in this third year playing with the Willmar VFW team. Kingery also played Babe Ruth and American Legion ball in Atwater. An incident in the summer of 1977 exemplifies the extent of the talent, skill, and leadership abilities that would eventually land Kingery in the major leagues. Curtis Eischens, the shortstop on the 1977 Willmar VFW team, teaches at Orono Middle School and remembers a game in Ely, Minnesota. In the first inning of the first game of a doubleheader, Kingery, singled. Seeing a chance to steal, Kingery took second. Kingery then sensed that the pitcher was not watching, so Kingery stole third. Then in a move that most people would look at as “in your face,” Kingery stole home. But, according to Eischens, Kingery was just doing his job. “Mike was just that good,” said Eischens. In fact, according to Steve “Snorkey” Johnson, Ely forfeited the second game rather than play the Willmar team again. It was clear that Kingery was the standout on a team that was filled with talent. Kingery was such a talent that he came to the attention of Kansas City scout Art Stewart. Between 1979 and 1986 Kingery worked his way through the Kansas City Royals farm system, from rookie ball in the Gulf Coast League through Class A Charleston to Class AA Memphis to Class AAA Omaha. Kingery is still in the Charleston record book in several categories as of 2008. On the career list, he is 10th in hits with 220 and fifth in batting average at .303; he is fifth on the single-season list of games played with 140. Kingery paid his dues, playing in the minor leagues for six years before making his major-league debut on July 7, 1986, against the Baltimore Orioles. He played right field and had two hits in four at-bats. In a way, this first appearance would be representative of his career. 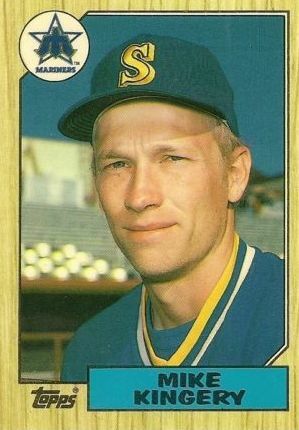 He hit adequately, fielded with authority, and everyone said “Who is that guy?” The name on his jersey was misspelled. Being there, contributing in a positive manner, and being part of the unit was always more important to Kingery than being in the spotlight. Batting and throwing left-handed and weighing in at 180 pounds, Kingery stood six-feet tall. Kingery spent all or parts of the 1986 to 1996 seasons in the major leagues. During that time he played with six teams, Kansas City (1986), Seattle (1987-1989), and Oakland (1992) in the American League and San Francisco (1990-1991), Colorado (1994-1995), and Pittsburgh (1996) in the National League. Kingery admits his batting technique was never strong. Statistics show his season batting averages fluctuated over his over his 10-year career, from a high of .349 with the Colorado Rockies in 1994 to a low of .107 with the Oakland Athletics in 1992. In Branon’s article, Kingery described himself as “just your normal person, born in a small town in Minnesota, just very common; . . . No swagger. No braggadocio. A normal person.” The central theme of the article implied that Kingery harkened back to an era when solid performance within a group dynamic was valued as much as personality and perhaps more than being able to grab headlines. So, while Kingery played for six different teams in 10 years in the majors, he made it to the postseason only once, in 1995 with Colorado. Kingery had two hits in 10 at-bats and scored one run as the Rockies lost in the first round to the Atlanta Braves. At the end of the season, Kingery, then 34, became a free agent and signed with the Pittsburgh Pirates on December 14, 1995. He played one season for the Pirates and was released by them on January 7, 1997. Kingery now operates Solid Foundation Baseball School, Inc., which he founded in 1997, teaching baseball fundamentals to high-school and college players throughout central and southern Minnesota. This has allowed him to remain active in the sport he has loved all his life, impart his knowledge of the game to future generations, and remain a substantial member of his home community. Thoma, Scott; “Oh Brother, What an Athlete He Was,” Sports Section, West Central Tribune, March 26, 2006. Middleton, Rand; “Memories of ‘77 Summer Remain Fresh,” Sports Section, West Central Tribune, August 2, 2006. Curtis Eischens Phone Interview, January 22, 2008. Dave Branon, “Ambassador to Baseball,” Sports Spectrum, July 1996. Mike Kingery e-mail interview, August 21, 2007. Charleston River Dogs (nee Charleston Royals), http://www.riverdogs.com/dogs/records. Mike Kingery e-mail interview, August 22, 2007. Dave Branon; “Ambassador of Baseball,” Sports Spectrum, July 1996. Curtis Eischens telephone interview, January 22, 2008. Middleton, Rand, “With Player Status on Hold, Kingery Becomes a Coach.” Sports Section, West Central Tribune, March 23, 1995, p. 3.